This is a photo of our most typical tour group. Left to right: Ed's brother and wife, Karla and Ed. Other expates from Benghazi joined our group in various combinations, and we all bonded and had a great time together. 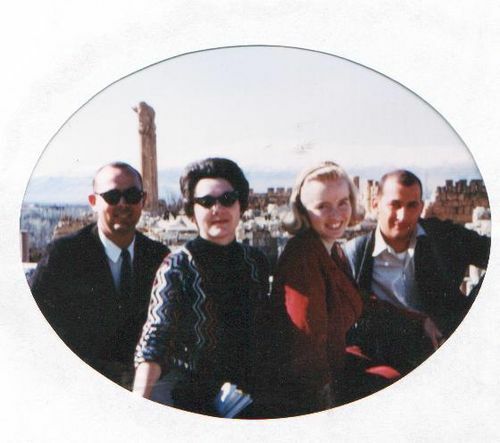 In the background of this photo of the four of us sitting high above Baalbec on a city wall is a series of huge columns which had comprised a part of the ancient Temple of Jupiter. Nearby, the Temple to Bacchus is more complete, but smaller in scale.